Don’t comb through your natural hair when it is dry. Only comb through it when it is wet. When it is wet, you decrease the friction between the strands of your hair, and the work of combing through it is much easier. You should also use some sort of product on your hair, like conditioner or a detangling aid to assist you when combing through your hair. Please read our article Detangling Natural Hair for more information about combing through natural hair. After recognizing that I needed to spend more time nurturing my hair from the inside out, I decided that I wanted to care for my hair without heat. I felt that this would be the best way to help my hair recover (see my previous post for details). After a lot of trial and error, I have come up with a low maintenance natural way to care for my hair. Basically I am defining the curls in my hair and wearing my hair in this state in between washes. I like this method because it leaves my hair really soft, and once I do it, all I to do maintain it is tie up my hair at night with a couple of silk scarves. When I get up, I take off the scarves, pull on my hair a little bit to arrange it, and I’m good to go. My favorite hair accessory to wear with this style is a simple fabric headband. Shampoo my hair with Northwest Scents™ shampoo. Cleanse and detangle with Northwest Scents™ Keratin and Silk Curl Cleansing Cream. Get out of the shower and apply Northwest Scents™ conditioner liberally to my hair to seal in moisture. Divide my hair into four sections, braid each section, and let the hair dry. Unbraid a section of hair. 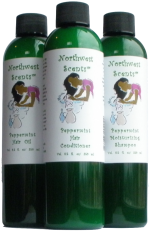 Apply Northwest Scents™ hair oil liberally to that section of hair. Separate that section of hair into smaller sections. On each smaller section I apply additional Northwest Scents™ hair oil, then I apply Northwest Scents™ hair gel. I rake the gel through the hair until it straightens out partially. I then twist the section. I repeat the above four steps until I have finished all of my hair. Then I let the hair air dry and I take the twists down. I then carefully separate the twists, and I am done. I have been experimenting with this method for a few months and I like the fact that it keeps my hair soft and it is easy to maintain between washes. In the photo above, I dampened my fingertips with a teeny bit of water and applied that water to the sections of hair in between applying the oil and the gel (Part B after applying the oil in step 4). What that did was use less gel and create a fluffier hairstyle. When I didn’t apply the teeny bit of water to the sections of hair I got more definition. The products that I have used are available in a sample kit (it is called the curl defining sample kit) for anyone who wants to try them. A Healthy Body Is Important Too! One interesting observation that I have made during my hair journey is that many people are not as concerned about the foods they eat as they are about the products they use on their hair. While I think that the products you use on your hair are important, I believe that taking care of your body from the inside out is even more important. What good is long hair if the rest of you is suffering from poor health? In the near future, will be writing posts on healthy foods that also contribute to healthy hair. One thing that I have learned in my journey to growing longer hair is to be patient. In the country where I live – the United States of America, most of us are used to having almost everything we want or need instantly. If we want to eat, we can go to a fast food restaurant and get a meal within minutes. If we want clothes we can go to the store and buy them instantly. If we want information about something, we can look it up on the internet and get a variety of answers (some good, some not so good) within minutes. But growing hair is one of the things that doesn’t work that way. Growing hair, takes time, and it takes patience. I’ve learned to slow down in my approach to taking care of my hair. Instead of rushing when I do it, I take my time. Twelve Steps For Growing Black Hair is now available on iTunes. So, if you are an iphone, ipad, or ipod touch user, you can order a copy to read on your device. For information click here. 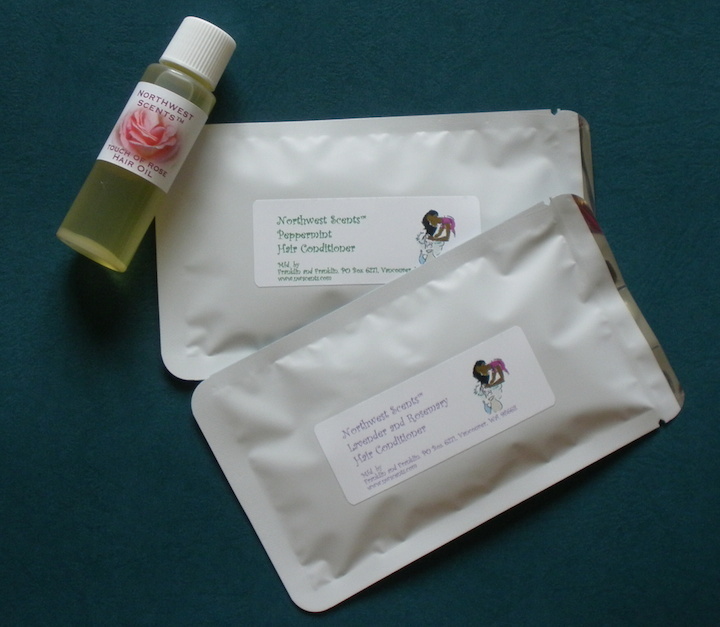 We have a new product available for detangling natural Black and Afro Textured hair. The product is called Northwest Scents Detangling and Cleansing Cream. It feels like a conditioner, but you use it like a shampoo. It cleanses without leaving the hair “squeaky” and while the product is in your hair (it should be put into your hair when your hair is soaking wet during the washing process) you can gently comb through your hair with a wide tooth comb to detangle it.